If Trump’s recognition of Guaido’s ridiculous Jan. 23rd declaration wasn’t enough, Abrams’ involvement should have been a signal: that Venezuela and the Bolivarian Movement must be defended at all costs. 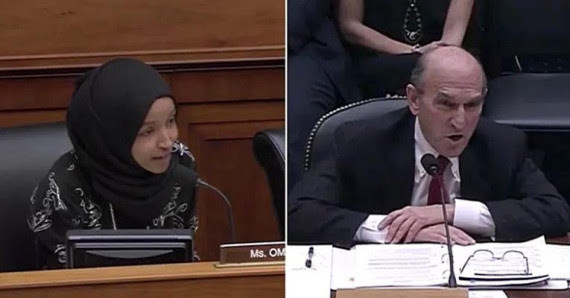 On Wednesday, congressperson Ilhan Omar electrified the world by calling out Abrams’ genocidal record in Latin America to his face—specifically referencing the 1981 El Mozote massacre by US-backed soldiers in El Salvador, whose government Abrams defended to the hilt. Abrams’ specialty in El Salvador, Guatemala, Nicaragua and other countries was dressing up murderous war policies as humanitarian efforts to promote democracy. This is what’s happening at the Tienditas International Bridge, a trademark Abrams’ stunt. The US has delivered bags of supplies to a bridge that has never been open to traffic. The Red Cross, whose leaders have denounced Guaido’s use of food as an interventionist tool, already operates in Venezuelan hospitals, with the full cooperation of the Maduro government. The Bolivarian government in Venezuela is internationally renown for reducing hunger. However, a malevolent US-orchestrated scheme has caused widespread food shortages. Guaido’s international-aid stunt is a Trojan horse designed to cause regime change. Maduro is right: if the US really wanted to fight hunger, it would stop the sanctions. As of this writing, 2,000 people have signed a call translated into 15 languages demanding an end to the US-backed coup in Venezuela. On February 23, the one-month anniversary of Guaido’s bogus announcement, thousands of people will march in more than 50 cities to denounce intervention and defend the Bolivarian Revolution. After this international anti-war date was set, Guaido announced Feb. 23 as the date “humanitarian supplies” will enter Venezuela. Corporate media has eaten up his pronouncements, as they did the Bush Administration’s lies about Weapons of Mass destruction. But on that date, the world will see a contrast: between a border publicity stunt organized by an unelected puppet — and a river of humanity marching across the globe to defend Venezuela.